As I am sitting on a train in the dark late October night heading for London I am spending my time surfing around some of the college golf websites. Golfweek is always a good one and their coverage of collegegolf is top of the line. As I look out my train window I think to myself, if I was a young boy, a golfer, with aims to become one of the better players in the world and I was based in England – what would I do right now? As dark as it is and as cold as it is, and as few chances of tournament golf as there are right now I am not sure I would be doing that much that would actually bring me towards my goal. I could of course be doing some gym work to build capacity for the future and work really hard to get ready for the next season. But I cannot help wondering what the players in the top teams in college are doing at this time. Do you want to know? They are playing competitive golf against their peers in one of the toughest fields that you can find in amateur golf – at Isleworth (yes, that is the home club of a certain Tiger Woods)! Ok, looking at the pictures it does seem to be a bit cold and perhaps the greens are not Augusta fast but I am sure they are not that far off. So who is in the most beneficial environment if the goal is to become a good golfer? Is it me in the dark in England or the guys out in the Florida sun? Most of our top junior players in England at some stage get approached by college coaches from some of the schools in the States. Some of them are offered deals in terms of scholarships that basically mean that they could get on the next plane and arrive for four years in the Florida sun, or any other sun, at no cost. Do you want to know what most of them say? The Eisenhower Trophy is over for this time and I am not sure what is worse for the English. The fact that England finished 14th or that Scotland won? I have said before that golf is a strange sport. Winning the World Championships is about developing players to be good but not too successful because if they start winning too much you might end up ‘loosing’ them to the professional game and then obviously they won’t be around to win the World Amateur Championships for you. 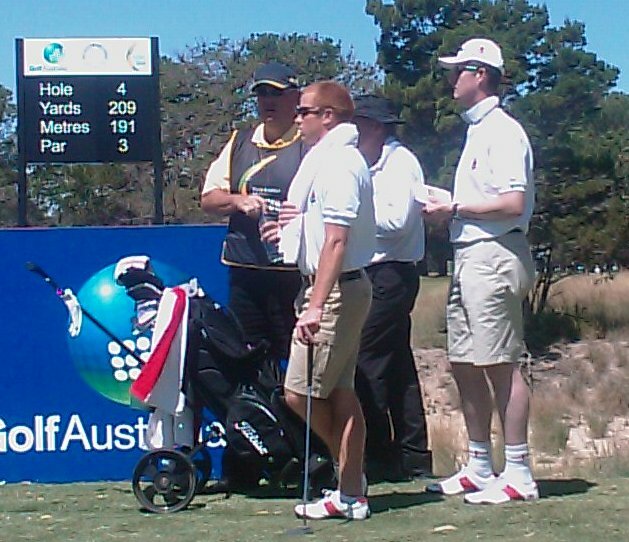 The reality that met the England team out in Adelaide consisted of two proper championship golf courses set up in the best possible way for a good test of golf. To manage these golf courses players needed the ability to hit a variety of shots, both in terms of height and left to right/ right to left movement. There is no doubt that in conditions like that the cream rises to the top and the best team definitely won the tournament. The England players simply have a few lessons to learn about playing Championship golf courses and Championship golf. We just need to make sure that they don’t leave thinking they putted badly or that the pins were impossible to get to. The truth is they didn’t have the shots needed to get the ball near enough. Or at least they didn’t use them this time. The good news is though that now they know and it can be worked on! “On a bright and sunny day in Adelaide the wind blew its hardest and many fell by the wayside with world number 1 (Danny Lee) following his opening 70, 71, 70 with a closing 84. The U.S.A fell away and Scotland prevailed in conditions which must have been as familiar to them as a warm summers day on The Old Course. Meanwhile after another ‘brunch’ and practice at The Grange where facilities were much better than today’s venue for our warm up we set out (from the 10th tee) promisingly at midday with birdies at 10 (Sam) and 11 (Luke) before then turning into the wind at 12 (a strong par 3) and coming to grief with two doubles and a bogey between us. Dale and Luke never quite seemed to recover despite bagging a few birdies thereafter and although they tried to the very end a persistent southerly wind (cold!) made it almost a damage limitation exercise for them. The par of 73 would have almost certainly have equated to a 75 or 76 CSS today. However Sam steadied the ship after his bogey at 12 and gradually compiled a great round in truly tough conditions to record the joint lowest round of the day (a 3 under par 70). Sam’s 25 putts being the main reason for his success. This was a reflection of the tight pin positions on what were very firm greens and his amazing short game. At close of play Sam finished 5th in the individual scores which Ricky Fowler led although The U.S.A could only finish runners up (as they did last week) and Sweden (last weeks Ladies winners) climbed to 3rd in the mens event. With 2 from 3 scores counting each day there were many potential victors at the start of this week. However at the closing ceremony we were reminded that 50 years ago it was Australia who won the inaugural event at St Andrews, Scotland. Maybe it was fate that decided Scotland should prevail in ‘Oz’ this year?! A disappointing position for England (14th) but with 6th place just 4 shots lower than our total (after 12 rounds of golf) its clear how small the margins are. For full scores and updates visit the International Golf Federation website. “Well what of ‘moving day’ ? After a really positive start, and with all of us optimistic about today, the expression ‘damp squib’ comes to mind! With relatively late times (3 consecutive groups from 11.45) a relaxed start was again possible. Following a quick trip to the shops for extra provisions and the morning ‘stretch/exercise, led by Coach Ridley, we breakfasted and once more made up packed lunches before setting off in the knowledge it would be a hot one! Iced towels all round and a quick start by both Luke and Dale the result being -8 after 42 holes. However, with Sam unable to get below par (4 birdies but he could not recoup the dropped shots he suffered) it was left to Luke and Dale who each conspired to shoot 73’s (+1) having initially got to -2 after 5 and 6 holes respectively. Their disappointment and frustration is clear to see but there’s no doubting the effort put in. Having started tied 7th we are now tied 12 and play alongside South Africa and Wales at Royal Adelaide on Sunday. Several teams came through with good scores today but we were not alone in being over par and slipping down the order. Scotland lead by 4 from The U.S.A who dropped 2 shots late in the day. With Ireland not far away all four of the Home Nations figure. Having completed their rounds in the hottest part of the day (33+ degrees) only Sam felt like putting himself through the ‘range’ with Dave Ridley on hand. We have not played par 3s (4 of them at The Grange) well at all and despite some spectaculer recovery play seem to accrue bogeys from the middle of the fairway too many times! Having dined ‘Chinese’ we returned to base having agreed to meet and review / plan Sunday early tomorrow morning. The forecast is a much cooler 24 degrees and should be more comfortable. With pin positions likely to be tough and greens that are extremely firm and undulating flight and spin control will be key on a classic sand based course. The boys know that our current position does not do us justice and they are keen to play good golf and score for once!!!! As the World Amateur Team Championships for the Eisenhower Trophy reach the final day in Adelaide you can follow the action on the live scoring provided by the International Golf Federation. “A late alarm for us all today with tee times either side of 1pm. Also plenty of time for a team stretch and another good breakfast/brunch with beans on toast as well as the usual fruit, yoghurts and cereal. We are all agreed that self catering is preferred given the flexibility it allows us. Fortunately Dave ‘coach’ Ridley has assumed the sandwich king mantel with daily orders taken and a goody bag awaiting each of us on departure for the course! The 20 minute journey to either course is now almost second nature and we have enjoyed being independent whilst others rely on the shuttle bus. On arrival at the club midday heat persuaded us to take refuge in the shade and reduce time on the range. Dale reported a slight back ache and was cleared to take a pain killer whilst Luke and Sam looked good and more at home in the surroundings than perhaps was the case on day one. Certainly the first 2 holes were kinder to us and -2 for two added to ouir overnight -1 put us onto the leader boards dotted around the course. Beware the injured golfer they say and once more this was the case as Dale posted a 69 (-3), having holed from 10 feet at the first hole for a par 5 despite a perfect drive. Sam’s round was a roller coaster with much to admire and some surprises along the way too! He played a superb approach at 18 to a very ‘tight’ pin and holed for a birdie to buy us a few extra minutes in bed tomorrow! Luke played well but suffered on the greens having hit the hole at least six times without the ball disappearing. His resolve is admirable and I hope he can get the low score he deserves before the end of the tournament! Make sure you follow ‘moving day’ on the live scoring provided by the International Golf Federation. “At last time to play for real and the 5 a.m alarm was actually welcome! After a stretch and breakfast in our apartment we headed for Royal Adelaide in the car (now commandeered from David Basham!) and arrived at the course to find no wind and a clear blue sky. Although at first cool enough to warrant a sweater or jacket it soon became surplus to requirements! Our 10th tee start was not ideal since it involved a 5 minute bus trip for players+caddies and a hike for the rest of us. Caddies are amongst the many many volunteers who have been enlisted by the authorities here. On arrival at the 10th tee no Bolivian player to partner Dale Whitnell so he set off, with a nervy 3 wood, in a two ball with Zimbabwe. Luke followed with Sam in game 3 and after 2 holes we had managed 2 pars, 3 bogeys and a double bogey! With a 210 yard par 3 next on the agenda! Not many smiling faces however all three players then found their feet and settled down to play solid golf and record two 75’s with Sam matching the others finishing birdie at 9 to post a 70 (par is 73). At the time of writing this appears to have given us the 3rd or 4th best score at Royal Adelaide where The USA played near flawless golf to be -10 and discard a score that most countries would have been delighted with! After such a poor start we were glad to post a sub par total but on reflection realise what might have been had we played well from the off. Observations were that the players could not hit woods on the range at Royal Adelaide where facilities are restricted unlike at The Grange and that waiting on the tenth hole (our first) was not ideal given the bus trip and logistics involved. Useful for round 3 on the basis our position is top half after 2 rounds as that will mean we play Royal Adelaide on the final day. Continue to follow the scores through the live scoring provided by the International Golf Federation. “The 0530 alarm was needed by us all today and indeed tomorrow it will be the same given the early tee time we have for round 1. Following a team stretch, led by Dave Ridley, and breakfast (led by JP!) 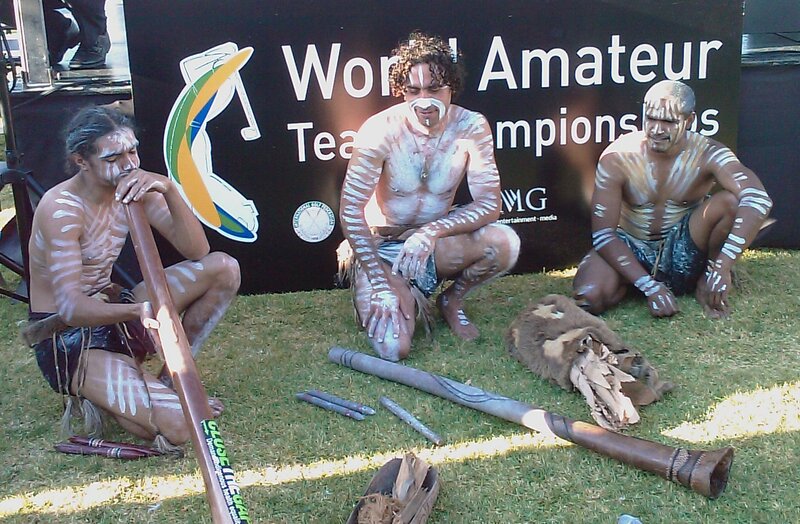 We headed for Royal Adelaide GC and the players warm up before our 0744 final practice round. A decision was made to play 9 holes only under tournament conditions and with a combined score of -3 including 8 birdies between the boys play was more than respectable. The question is can we cut out the mistakes/ minimise the damage (5 bogeys) and make our score potentially a winning one? Given our 10th tee start on day 1 we also played 10 and 11 before heading for the clubhouse and a food stop before some ‘time out’ and a visit to the beach and what a beach! Miles of sand and very few people + a huge Pelican wading in a lagoon! Having buried Dale in the sand we took in the rays and had some fun. A couple of hours away from golf did us all good and topped up the tan ready for our 3pm date with the official photographer. Having first smiled for the camera the grin on the boys faces immediately thereafter may have had something to do with a fashion show also being staged in the hotel today! As play gets underway in Adelaide you can follow the action on International Golf Federation’s live scoring.